“Last season was just a tease, this season will be better.” said Darius Williams after a solid freshman year at Northeast Mississippi. After averaging 9.6 points per game and shooting 36% from three, 6-foot-4 wing Darius Williams is due for a breakout year. Consistency will be key for the Lexington, KY native as he will lead a talented Tigers squad that lost in the Region 23 championship to Jones County 91-88. It wasn’t the best outing for Williams, finishing with only 6 points on 2-8 from the field (1-5 3pt). The Tigers had also lost to Jones County in the MACJC state championship game just a week before in a lop-sided effort. Definitely not a way to end a season but thankfully Williams has another season to make up for it. Head Coach Cord Wright has some key guys returning as well as a key transfer or two and Darius Williams will be looked upon to help lead the charge. We had a chance to see Williams in July at Juco Report’s Elite 150. He displayed athleticism, motor and shot it well from three. He has nice size on the wing and has garnished attention from low-mid level division-I programs. His motor and tenacity is what has attracted coaches his way plus the improvement of his overall game. Arkansas-Little Rock, Samford, Southeastern Louisiana, Tennessee St and Tulsa have all shown interest thus far but no one has offered as of yet. Juco preseason jamborees will be important for Williams as far as his recruitment as well as developing into a new leadership role. Northeast Mississippi will be on hand at Juco Reports Battle of the South in Atlanta, Ga October 7th. “He’s been killing it since we’ve been back in school.” Coach Wright mentioned. 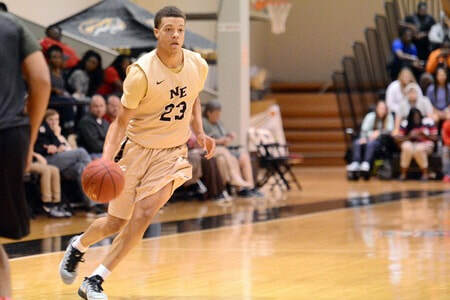 Look for Williams to emerge in a fashion his former teammate and now Murray St guard Leroy Buchanan did last year for Northeast Mississippi.